Paweł Łyczkowski (plyczkowski) triaged this task as Confirmed, Low priority. I like version 4, but feel version is more readable? Might look better in light gray.. will investigate. I feel like the symbols get lost in the shadow of the cubes for 1-5, maybe try switching the shadows to the left or the symbols to the left? For 6, the symbols are lost completely. 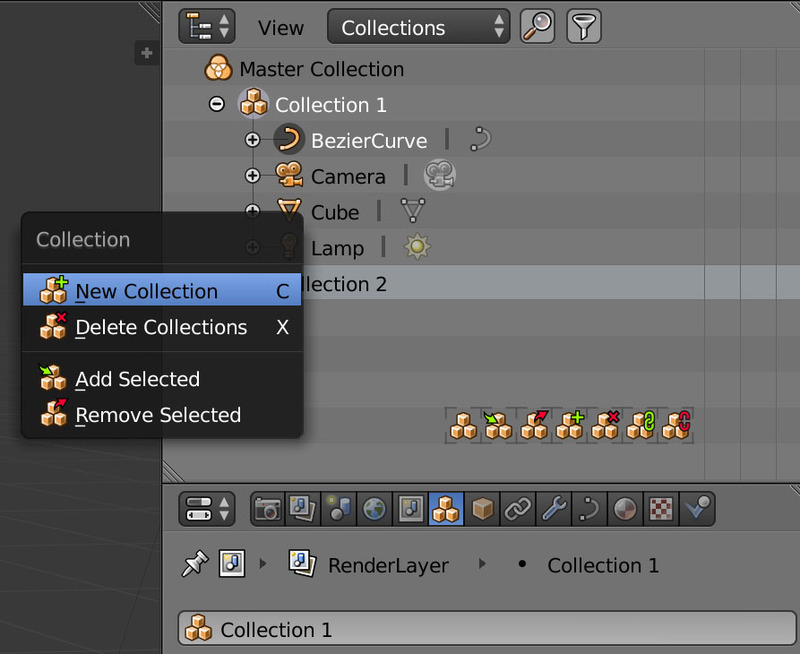 Just to be crystal clear here, are those the icons to add/remove objects to collection or to create/delete a new collection? I like the cardboard box one (4 or 5). 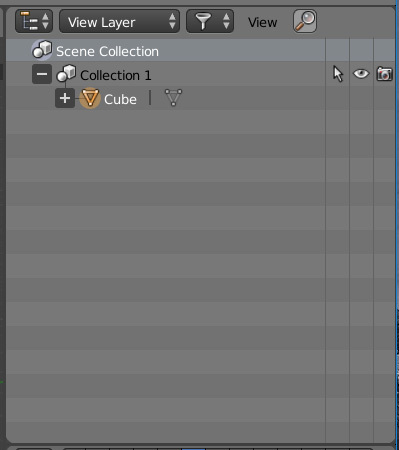 I also like the first one but the icon for "group" already looks like a group of objects (a sphere and a box) and having a group of three objects as the icon for collections is a bit confusing. Having all collection-related icons in a different color could also make sense - after all we already have a color code within the outliner : orange (objects), grey (data), blue (modifiers). Why not have them in say, green ? It could also help differentiate at a glance what is a collection and what is an object (color stands out more immediately than shape, I think). You got my vote for 4 or 5. Quite clever. However, i'm not quite sure is the cardboard box enough distinguishable from the 'cube' object. Perhaps opening the lids a little bit? As for faded + / - symbols, since being essentially white, they should be more visible in the shadow. It is my impression their black border is suffocating their white fill into gray. Why not going for a whiter fill or thinner border or a slightly bigger symbol? Try them out in the interface though, maybe they are visible enough. This is from an expert - it does. 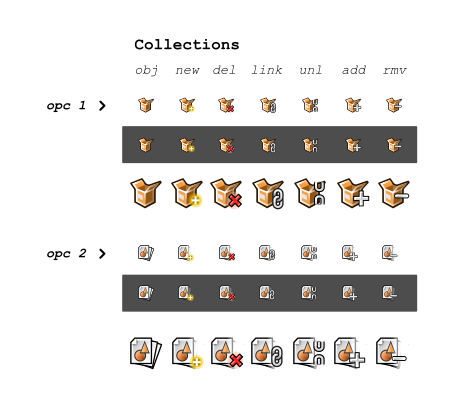 And what about the current 2.8 icon for the collections (three horizontal lines)? That seems pretty distinguishable in the UI. Or is it more suitable for layers (sheets of foil on top of each other)? As for the green color, at first i was totally for it, but now i realize the groups will be kept in 2.8? 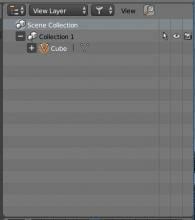 So, now for organizing the scene we have layers, collections as well as groups? If so, the green would perhaps be more suitable for group icons, if they are planned. On that note, maybe a new color for collections, like purple (violet)? 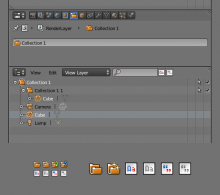 Not sure why groups are kept around actually, wouldn't collections completely fill the functionality gap ? As for the three horizontal lines, don't you think it's really too generic ? As you say, it could evoke stacked layers, or pretty much anything else... additionally it is quite connoted because this design is used more and more on the web and in other programs (Firefox comes to mind), and in those other contexts it usually means "menu" or "more...". I like the "half-opened box" idea though. I think the cardboard box is symbolizes an archive, packing, moving. Here is more suitable stack, folder, row of books. Also, if New/Delete… icons are used only in the context menu, then they are not necessary, as well as the other menu without icons. 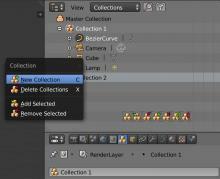 The three columns are "New Collection", "Add to Collection", "Remove from Collection". @Yevgeny Makarov (jenkm) I like that. I also feel like we should go with orange, since we are dealing with collections of objects , and also the outliner will just look nice. Also going for a folder could be best since it's the most standard and recognizable. Not sure about 2 folders in one icon though, since it somehow points more to a group of groups? 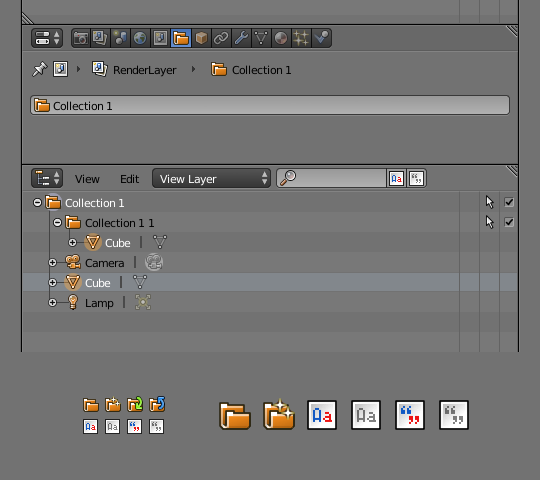 One more idea - two joined folders, as the object can be shared by multiple collections. Bringing the design from @Martín Sanchez (Martincho84) into this thread. It's so great to see so many involved in this, thanks everyone! 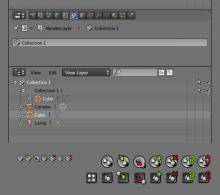 From all the options I think the most recognizable shape might be the folders. However, the two bright tabs add noise without making clearer the fact it is a container. In the original icon (in the file browser), the design is clear that it is a folder, a container. 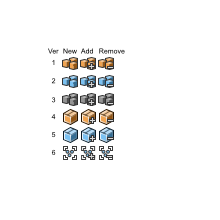 I wonder if we should use the same icon but add something in it, or color it different. Maybe it is not such a bad idea to go with a different color for Collections altogether? @Dalai Felinto (dfelinto) from the data point of view, Collections are completely different from Objects, right? So we could argue that they could have a different hue than orange. Agree, a different color (hue) should be fine. I leave you a proposal. I have done it vectorially, but when I rasterize it it does not have the contrast that I would like, for this reason I have contrasted and outlined it by pixel. If it is of your interest I can improve it or pass the .svg file. I personally like 2 and 5 most. @Matej Junk (MJunk) For me a bit too much color on that small size. Add and remove ones specifically become unrecognizable with the white paper added, they appear to be totally different tools. Perhaps simplifying the colors a little bit, give that blue notebook a greater role. Maybe mono-chroming those secondary symbols, and letting that paper just peek from inside of the notebook (as it is being slided in or out). As for me, the carboard box and Pawel's folders leed the race for now. Perhaps the Venn diagram idea could be put in action trial also? I quite like Matej's proposal! @Okavango (Okavango) here's an action trial and the svg in case you want to play around with it. Thanks @Pablo López Soriano (kednar) , nice, feels quite natural and distinctive. For some reason, the third one is my favorite. I'm not sure guys, seems there is more than one good proposal. @Paweł Łyczkowski (plyczkowski), @Okavango (Okavango) (Okavango), Pablo López Soriano (kednar) - Thanks, I appreciate your feedback. First of all, to say that there are very good designs. 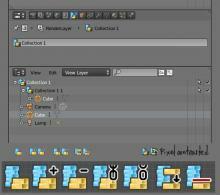 Although the folders or blocks look fantastically, I think they symbolically do not represent well 3D objects. The icon of the three groups represents more than one Collection. My icons with batteries are not well understood and the circular ones have a very common shape and silhouette. I have made a small collage with different proposals, apologize for appropriating some of them. and the Pablo López Soriano icon to represent the Master Collection. The cubes represent objects and the circles groups. 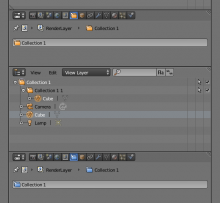 Their silhouettes are similar and different from other Blender icons. I leave a file with all my tests in case you want to take something. 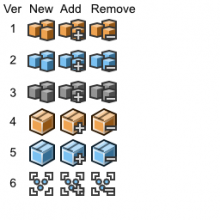 Going back to main topic - I really like general idea of "Collecion" icon, that Albert (wevon) show us. 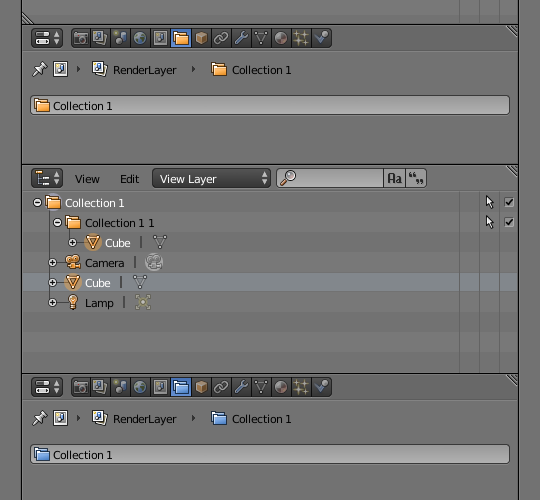 If anything if those general icons are not enough icons like that could be added and be used everywhere in Blender making the UI more consistent. As for the main collections icon itself I think the third venn diagram icon looks really good. I´m also voting for the third Venn diagram for collection. Btw, how do we know "when" the official icon will be picked? Is there going to be a voting poll? @Andrzej Ambroz (jendrzych) You read my mind, I fully agree with you. I always read labels in the file menu. 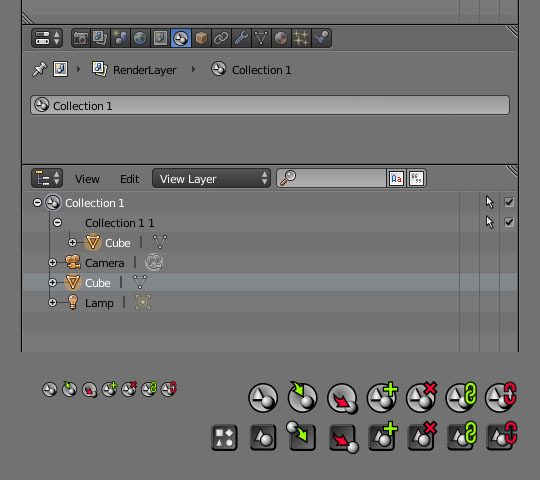 For example, look at the import/export icons - they are the same, they can be swapped and nothing will change. Btw, if anybody doesn't know, this is the guy that did most of the current icons in b3d > @Andrzej Ambroz (jendrzych) , so take his advice seriously. Definitely yes. They surely look the most modern out of all. A bit too abstract for my taste but the flat style is on point and this kind of design definitely here to stay in most professional applications. Anything but a generic folder icon. I dont think they go well with the Master collection icons. You went from something very abstract to something very obvious. To be honest that kind of isometric design is kinda dated. Also the + and x and arrow signs are garish and ruin them. We should be focus more on pure shape power (that should be equally efficient if represented in black and white, monocolor or in some sort of 3d pseudoperspective). 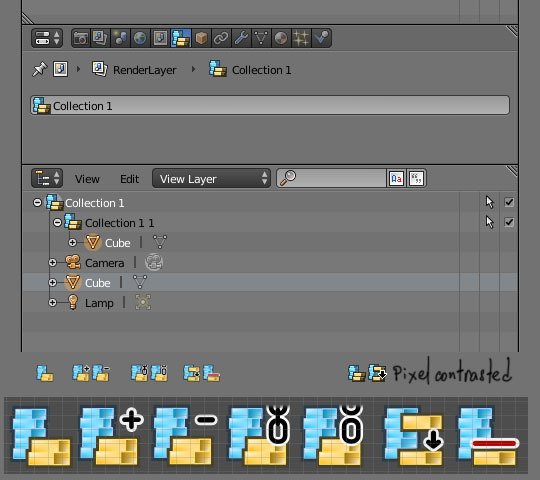 Has anyone thought of allowing users to color-code (groups of) objects? This is just something I had in mind for a few weeks now, maybe you guys can give your opinions. The most simple thing: better icons for "plus" and "minus" in the Outliner. They are visually bigger, easier to click and simpler in design. Since we decided to merge groups and collections, we used the group icon which we think worked well already. So thanks all for the designs, unfortunately we didn't get to use them.